Just looking at a new Corolla might give you an adrenaline rush, and we want you to feel the same thrill behind the wheel. The sport-inspired, wind-tunnel-tested, aerodynamic design isn’t just for show; it allows for better handling and fuel economy. Release your inner driver. The available sport button on the center console of Corolla S allows you to enable Sport Mode, in which the Engine Control Unit and simulated shift points are adjusted to give a sportier feel to your drive. Road conditions change quickly, and good suspension is important for maintaining a smooth ride. The rear suspension has been tuned for a more comfortable ride and better performance over rough roads and potholes. 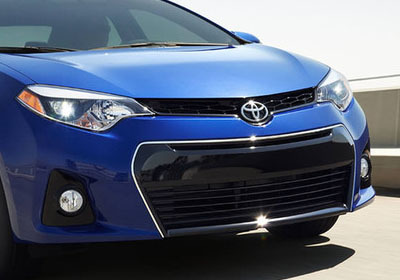 With an appearance that matches its attitude, Corolla S offers a piano-black grille highlighted by chrome trim. It's just as aggressive and bold as the rest of the car. 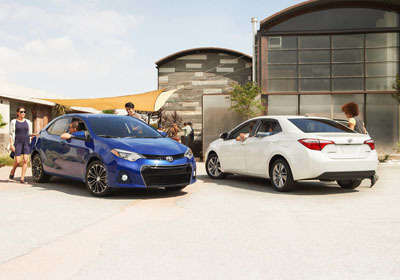 Even sitting still, the 2016 Corolla has a heightened presence. This is the way temperature control should work on every car. Have a favorite temperature? Just select it using the digital controls, and the car will always keep the interior feeling just right. It’s like having the weather on autopilot. Let the light in from above. The available moonroof lets you gaze at the stars, enjoy a coastal breeze or just take in the big blue sky in a new way. We imagine you'll find plenty of reasons to always keep it open. So much space, it's inspiring. Corolla gives you the rear cargo space 10 you need to haul all your stuff. Now you can feel free to indulge in all your hobbies and not feel limited by a tiny trunk—so go get started on that next passion project. Now your friends will fight over the back seat. 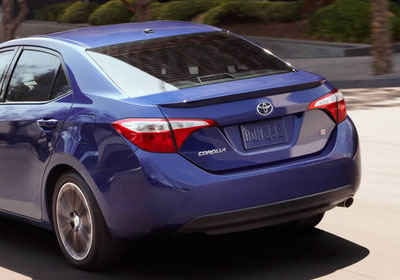 Corolla was designed with extra space for your rear passengers so they can kick back in the back seat a little easier. Designed to inspire the driver. Available on Corolla S, the sport gauge cluster offers an eye-catching illuminated speedometer and tachometer, a TFT monitor and plenty of easy-to-read data to keep the driver informed. More music. Easier phone calls. No wires. Integrated Bluetooth® technology lets you take calls from friends and stream your entire music library without ever needing to take your phone out of your pocket. When you’re in Reverse, the available backup camera helps by giving you a view of what the camera detects from the rear. This feature is especially useful when you’re parking in a tight spot or backing up. Toyota is devoted to safety and dependability, and proper vehicle maintenance is important to both. That's why we include a no cost maintenance plan with the purchase or lease of every new Corolla for 2 years or 25,000 miles, whichever comes first. 24-hour roadside assistance is also included for 2 years, regardless of mileage. Corolla comes with Whiplash-Injury-Lessening (WIL) front seats that can help reduce the severity of whiplash injury in certain rear-end collisions. A driver and front passenger Advanced Airbag System, front seat-mounted side airbags for the driver and front passenger, front and rear side curtain airbags, plus driver knee and front passenger seat-cushion airbags. They’re all part of a system designed to help keep you safe.